Here's the second instalment of our monthly project taking a defunct public transport operator from around the country and reinventing it for the roads of 2015. We're looking back at their past branding and liveries to create a modern twist on their appearance as a showcase of what can be achieved. 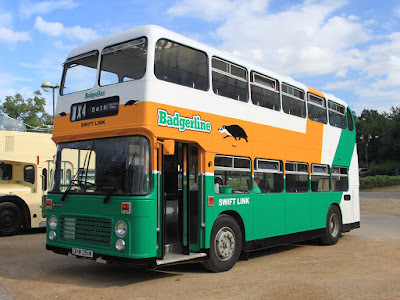 This month it's Badgerline - a bus operator in and around Bristol from 1985 until 2003. Initially a part of the Bristol Omnibus Company, it was privatised in September 1986 being sold to Badgerline Holdings in a management buyout. It went on to purchase a number of bus companies in England and Wales. In November 1993, Badgerline Group was listed on the stock exchange, and on 16 June 1995 merged with the GRT Group to form FirstBus. And here's the updated identity with a crisper, cleaner and more recognisable execution.